What messages are children’s movies sending about weight? Inspiration can strike when you least expect it. For Eliana Perrin, a UNC pediatrician and obesity researcher, the idea for her latest project came from her eight-year-old son. Perrin was watching children’s movies to see how they portrayed physical activity, nutrition, and stigma. As she and her son settled in to watch Alvin and the Chipmunks: The Squeakquel, she gave him a copy of the behavioral-coding sheet she was filling out. “I actually never checked how he coded things—I was just giving him something to do during the movie,” Perrin says. “But later he went to a birthday party, and afterwards he said, ‘Mama, I saw a movie that would have been good for your stigma project.’” He told her about an overweight girl in the movie who was eating cake and being made fun of by her friends. Perrin was impressed that he made the connection between weight and stigma just from listening to dinner conversations and watching a few movies with her. “We have a chance at media literacy with an entire generation that can potentially learn to see their environment through a new lens,” Perrin says. 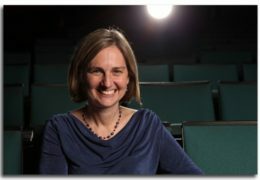 So, with her husband, UNC sociologist Andrew Perrin, she wrote and won a grant to investigate what messages about health and obesity kids are taking away from movies. Perrin wants to understand the roots of obesity in society and has conducted extensive research into its treatment and prevention. She became interested in obesity research during her residency, when she saw many families struggling to make ends meet while still trying to eat healthfully and be active. Her lab developed a color-coded BMI chart to help low-literacy parents, in particular, understand their children’s weight and begin conversations about making changes. In a 2010 study, the lab found that a toolkit that included this chart increased healthful behaviors in families. Currently, Perrin is leading a clinical trial of more than 860 children, in which pediatricians help low-literacy and low-income parents avoid unhealthful behaviors for their infants. 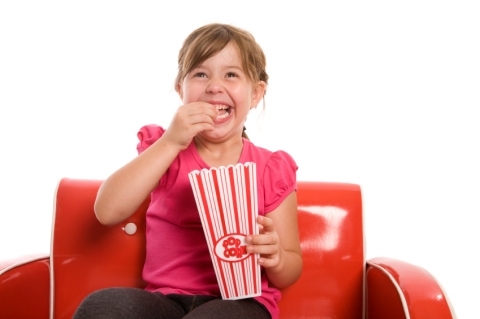 Unhealthful behaviors for children include watching lots of television and eating foods that are calorie-dense and nutrient-poor. Perrin says one way to prevent child obesity is to respect your baby’s satiety, a fancy word for fullness. In a November study published in Obesity, Perrin and her team evaluated 20 popular children’s movies and found that 70 percent contained weight-related stigmatizing, in which a character was ridiculed for being overweight. An analysis of how food and physical activity were treated on-screen revealed that segments with unhealthful behaviors outnumbered segments with healthful behaviors two to one. With her latest project, Perrin aims to understand how children receive the cues about health behaviors and obesity stigma. She describes the stigma surrounding obesity in movies as sending a very conflicting message to children. Bullying is already prevalent in our society, she says, and obesity researchers think that it may be responsible for perpetuating obesity itself. The project began last month and is expected to run for about two years. It will involve a team of experts from psychology, psychiatry, journalism, art, sociology, health policy, and pediatrics. Soon they will start enrolling children ages 9 to 11, who will watch films at the Varsity Theatre on Franklin Street. Eliana Perrin is an associate professor in the Department of Pediatrics in the School of Medicine. In September, she won a Phillip and Ruth Hettleman Prize for her achievements in the field of obesity research.